Sometimes, it feels like there just isn’t enough time in the day. As a manager, your time is in constant demand. You deal with personal work responsibilities, team management, social obligations, and all of the other chores of every day life. You may begin a task, only to look up at the clock and realize that several hours have passed by without much progress. You may even forget about certain responsibilities because you’re too busy taking care of something else. Time management is a skill that everyone wants to learn and utilize, but it may seem like a very nebulous concept to learn and incorporate in your life. Maybe you’ve looked up some time management techniques, but it was too time-consuming to search through the results and make them work for your own circumstances. To save you some time, the team here at Priority Matrix has gathered up the best time management exercises into an easy-to-read list. If you pick out the ones that seem to fit best with your responsibilities and work style and stick with them, I guarantee you’ll find yourself getting more done with less stress. 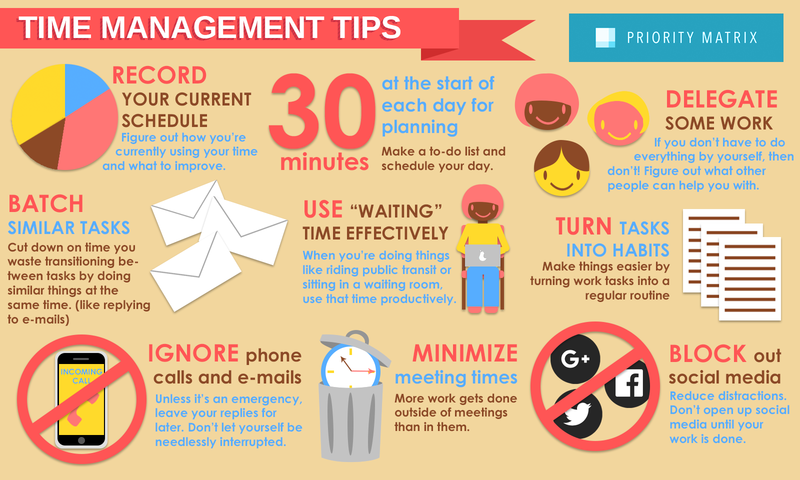 Before implementing any of the time management exercises on this list, the first step is to figure out the exact areas you can improve on. During a routine workday, record how you spending your time. You’ll notice specific blocks of time that weren’t as productive as you wanted them to be, as well as things that might have interrupted your workflow and distracted you. After you’ve recorded your schedule, try using this daily schedule tool to examine how you’ve been prioritizing your time. You might be surprised at the amount of time you’re wasting. Expecting yourself to remember every single thing you have to do off the top of your head just isn’t reasonable. Forgetting even one task can lead to needless stress and wasted time fixing consequences that arise. Do yourself a favor and make a list of all the things you need to do, whether it’s just things that day or a list for the whole week. Here’s some tips on how to make an effective to-do list. A tickler file is a collection of folders, with each one corresponding to each day of the upcoming month, as well as folders for each of the 12 months of the year. Place notes and documents with dates into the folder that matches the day you need to do something with it. For example: let’s say you get someone’s business card and you’ve decided you want to give them a call a week from now. Drop their business card into the folder that matches that date. When you check the folder for that day, you’ll remember to call them, and their contact information will be readily available. It’s a system to help remind you of due dates, upcoming appointments, recurring tasks, and just about anything else that you need to remember in the future. It’s a great way to keep you from forgetting things later on, as well as organize papers and documents. Here’s a more in-depth explanation on how to organize and utilize a tickler file system. Use your time more efficiently by taking some time to make a schedule. By outlining all of your plans for the day, you can figure out what order you should do things in order to be most efficient, as well as keep in mind how much time you have in a day for certain tasks when you take meetings and appointments into account. Make the schedule flexible and leave buffer time between tasks. If you stick to your schedule, you’ll get the most out of your day and minimizing wasted time. The “Pareto Principle” states that 20% of what you do leads to 80% of your success and results. If you want to be as productive as possible, you should identify what that most important “20%” of your work is. Dedicate as much time as you can to those key activities. If you’re ever running short on time and you’re not sure what to do, make those key activities a priority to maximize success. Other people are going to ask you to give them some of your time, every day. Some studies say this can happen over four times per hour. Whether it’s a phone call or a visitor to your office, interruptions are bound to happen. The best way to keep them from interfering with your workflow is to account for this in your schedule by creating a block of time when people can contact you without an appointment and communicate this window to the people you work with. Spend this block of time doing something that can be interrupted without issue, such as organizing your desk, so that any unexpected visitors aren’t interrupting your concentration and productivity. If someone comes to you during another time and asks you to do something, you can spend this scheduled block of time doing what they asked for. Expect the unexpected, and you’ll waste less time in your day. The best way to use your time is to spend it on the most important things you have to do. Setting your priorities straight keeps key tasks from accidentally being given a backseat when other less important things pop up. One great system for arranging your priorities is employing the 1-3-9 Productivity System. By splitting your tasks into different levels based on priority, you can take advantage of something called the “Zeigarnik Effect” to build momentum and complete task after task. If you don’t think a traditional time-block schedule will be an effective tool for you, personal deadlines might make a good substitution for you. If you have certain things you want to complete during the day, set deadlines for your tasks for certain hours of the day. For example, let’s say you want to finish developing a proposal for the next meeting tomorrow. You can set a deadline for yourself to complete it by 2pm, instead of explicitly setting aside of window of time to work on it. This is a good system to use if you tend to get more unexpected interruptions during your work day. A key skill for any manager is learning how to effectively delegate. One person can’t do everything, and there isn’t enough time in the day. If you find that there are a lot of necessary tasks piling up and your workload is getting heavier than you can manage, hand some work off to someone else. Passing the torch when necessary will make work go more smoothly for you, and you’ll be making the most of your team’s collective skills. Effective time management lies not only in making the most of your own time, but figuring out how to use other people’s time to make your overall workplace more productive. Cut down on the time you take transitioning from task to task by “batching” similar ones. For example, if you have to deliver some documents to different people around the office, set aside some time to make your rounds all at once. Another example is to set a block of time to reply back to all of your e-mails at once. It saves time by minimizing the time you spend getting into different work mindsets and set-ups. There’s a lot of time in the day that you might not be using effectively, such as when you eat, ride public transportation, or sit in a waiting room. With things like free wi-fi, smart phones, and laptops, there’s no reason why you shouldn’t be taking advantage of these time periods. Spend this time doing things like working on your schedule or preparing for other tasks later in the day. If there’s anything that you shouldn’t use “waiting” time for, it’s calls and communications. Trying to spend the extra time on quick phone calls will lead to ineffective communication. You should set aside time specifically for making calls and other important communications. Take 5 minutes before each call to figure out what you want to get out of it, and make list of all the bullet points you want to hit. Then, take 5 minutes afterwards to reflect on how it went and the information you received. Make sure you’re in an appropriate setting for phone calls, as well. While it may be hard to resist, don’t answer e-mails and phone calls immediately. E-mail replies and phone calls should “batched” tasks. Answering them immediately is both distracting and interrupting to your workflow and concentration. Unless it’s a very important message or communication that requires an immediate reply, chances are that the person attempting to contact you will be fine with you contacting them back later. Identify important tasks that you need to do regularly, and turn them into habits. As you do it more often, it will become easier and faster to complete. If you’re used to doing something, it will take less effort to get yourself to do it, as well as less stress. Of all of the time management exercises on the list, this was one of our staff favorites. The more you can ‘automate’ routine tasks, the more time you open up for forward progress. Make sure you give this one a try. Very little tangible work can be completed in meetings, so try your best to schedule as few as possible and minimize the time you spend in meetings. If you’re the one in charge of a meeting, try to make the meeting as short and productive as possible. Set an agenda that you want to complete before the meeting is over, and set a time for the meeting to end. You’ll get more done if you have a goal you can focus on and a time constraint to follow. If you have any time to get an early start on work, do it. Start tasks as early as possible, not only to increase the quality of your work but to also to allow more flexibility in your schedule. Early starts will make work less stressful, and you’ll be more productive in the workplace. Having your work finished before you take a break will let you relax much more effectively. You’ll also get a sense of satisfaction from finishing your work early. If you really need to buckle down and get work done, don’t hesitate to use “do not disturb” signs. Using them can keep people from interrupting your concentration or distracting you from work. Turn off instant messaging, as well. Unless your work necessitates the use of social media, don’t look at it during your work hours. Reading messages and scrolling down Facebook walls can wear away at your time without you realizing, and will easily interrupt your workflow. If you’re not sure you can resist the temptation, consider using browser extensions to physically prevent you from accessing the most distracting websites. You’ll get much more done. As tempting as it may be to take every opportunity and request that comes your way, make sure you’re not overburdening yourself and the people you manage. Examine what’s currently on your plate, and say “no” if it looks like you’re too busy to handle it. Good time management requires that you have a good understanding of your limitations and that you plan accordingly. It’s much better to reject a work opportunity if there’s a possibility that it will interfere with other responsibilities that you already have. If you finding that there just doesn’t seem to be enough time in your work week, it’s OK to spend some time working on the weekends. If you spend 3-4 hours working during the weekend, it can make your upcoming work week easier to get through. Just make sure you leave time for proper rest and relaxation, because stressing yourself out by overworking will just make you less productive. Our final tip time management tip is to take care of your health. Make sure you get at least 7-8 hours of sleep every night and eat proper meals. If you’re tired or hungry at work, you won’t get as much done and you’ll probably feel miserable. No matter how much coffee you drink, it’s not a substitute for a good night of restful sleep. You’ll find it’s much harder to get any work done if you’re sick, injured, or falling asleep at your desk. Shut down your Mail application for an hour at a time. Not checking email, and not having pings every few minutes will allow you to focus. Turn off notifications on emails during your “in the zone” hours. Wear large noise-canceling headphones so that others get the hint that you are focused on the work at hand. Even better, encourage this as a policy at your workplace – we do here. When trying to focus, do not do anything else distracting. It’s convenient to open another web browser, or check your phone, with the excuse that you’re thinking. It doesn’t work. Don’t make that excuse, and keep your screen focused on the work at hand. As a corollary to (5), simply close your eyes if you need to think. Of course, we know you don’t have the time to try all of these time management exercises at once. Pick a couple of your favorites and let us know how you like them!